In the previous installment of my Director Retrospective project, we took a long look at the films of Sam Peckinpah, a director very interested in exploring American mythos and masculinity (particularly in his explorations of “the West”). So I thought it might be fun to shift gears a bit — to look outside the United States and at a director whose work frequently explores modern / contemporary life in very non-heroic terms. Today, we’re thinking about the filmography of English director, Mike Leigh. Secrets & Lies (1996) – Starring Brenda Blethyn, Marianne Jean-Baptiste, Timothy Spall, Phyllis Logan, and Claire Rushbrook, Mike Leigh’s Secrets & Lies primarily follows two characters: the nervous Cynthia (who struggles to have a relationship with her grown daughter and feels abandoned by her financially successful brother) and career-minded Hortense (an optometrist who, after the death of her elderly foster-parents, decides that she wants to know the identity of her birth mother). Of course, things are complicated when it’s discovered that the African-American Hortense is the illegitimate daughter of the caucasian Cynthia — which causes both characters to explore past difficulties, class divides, racial difference, and complicated family dynamics. Both Blethyn and Jean-Baptiste are superb here as the recently reunited Cynthia and Hortense, as their characters are excellent foils to one another in terms of personality despite their respective desires to feel connected with one another and to feel as if they belong somewhere. Apparently, Leigh intentionally kept all of the actors in the dark about certain parts of the script, meaning that they didn’t know about some of the twists. [Allegedly, the first time that Cynthia and Hortense meet in the movie is the first time that Blethyn and Jean-Baptiste met in real life, so their surprised reactions are somewhat authentic as they didn’t expect their mother / daughter to be a different race than themselves.] Aside from the excellent performances by these two leads, the supporting cast are all given their moment to shine — particularly Spall’s Maurice, whose impassioned speech at a disastrous family dinner helps the family to finally open up to one another. It’s clear that all of these characters love one another, but they struggle to show it, perhaps out of fear that their love will not be reciprocated. A deeply moving and emotionally resonant film, Secrets & Lies makes a case for vulnerability and empathy, something that is always relevant but seems especially important today. One of the great films of the 1990s that has, unfortunately, been somewhat forgotten and deserves to be re-discovered. Vera Drake (2004) – Aside from perhaps Happy-Go-Lucky (a good film in its own right), Leigh’s Vera Drake is probably the movie that most American audiences are familiar with, if they are familiar with any of his films. After all, it received some decent publicity upon its release and garnered critical attention as well. [It won the Golden Lion at the Venice Film Festival and received several Academy Award nominations as well.] The plot is set in London post-WWII and focuses mostly on the eponymous Vera Drake — a kind and compassionate working-class maid who cares for her family and many of her neighbors. She also happens to perform illegal abortions for women, whose circumstances make childbirth difficult or impossible (for various reasons). One of the only true “period pieces” in Leigh’s oeuvre, the costuming and set-design is effective here; and it’s interesting to see how, even though the particulars have evolved, many of the same working-class themes and difficulties of the present day can be explored in the past as well. As with nearly all Leigh’s films, the cast is the strongest aspect, bringing both a sense of authenticity and an ease to their roles. 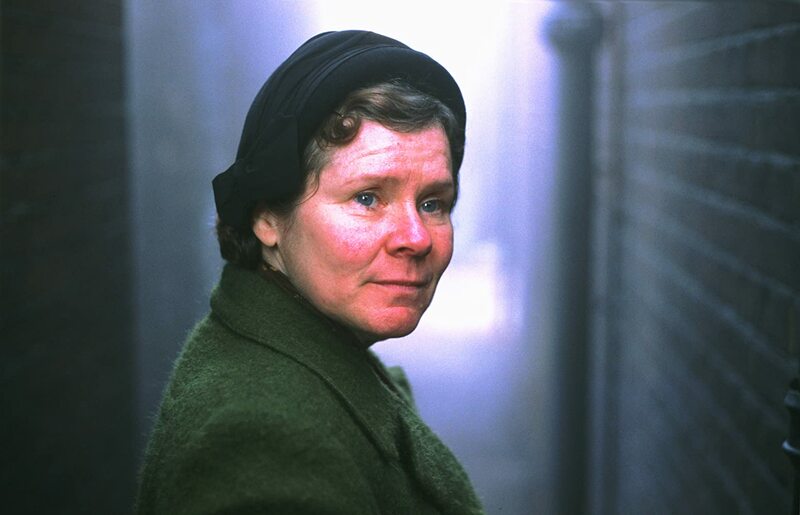 But the standout here is 100% absolutely Imelda Staunton as Vera Drake. Watching her character arc unfold in the film is absolutely heartbreaking as a woman who suffered a past trauma and has, as a result, resolved herself to caring for others to the very best of her abilities, despite her modest means. [If you’re only familiar with Staunton from Harry Potter, where she plays the totally irredeemable Dolores Umbridge, do yourself a favor and watch her performance in Vera Drake, where she plays as different a character as one could possibly imagine to Umbridge.] While Staunton was nominated for an Academy Award for Best Actress for this performance, she didn’t take home the Oscar — which is a bit of a shame, as I really do think her work was the most deserving of those nominated that year. Everyone should watch Vera Drake, but just be ready to experience some feels. 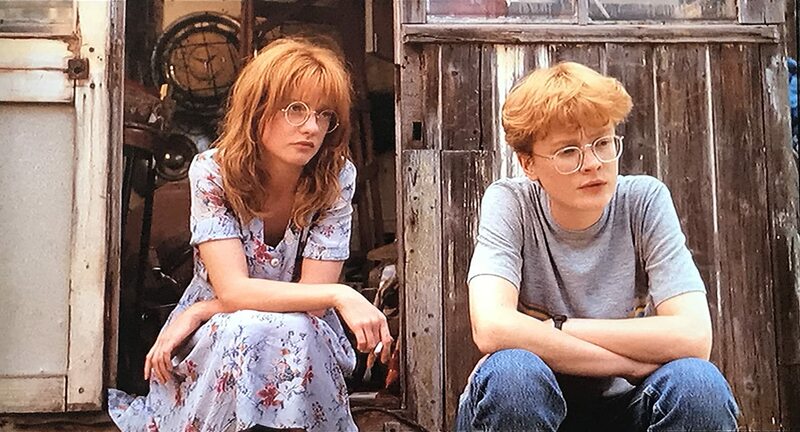 Life is Sweet (1990) – In some ways, Leigh’s third feature-length film — and the first “masterpiece” of his career in my opinion — is also his most surprisingly optimistic film. That’s not to say that bad things don’t happen in Life is Sweet. After all, would it be a Mike Leigh film if it was devoid of sadness, disappointment, and working-class ennui? And here we get serious issues like eating disorders and sexual harassment, as well as lesser (but still soul-crushing) disappointments like career dissatisfaction and geographical restlessness. And yet, somehow, the film never gets bogged-down in its sadness — largely because of the optimism of some of its characters, who are able to see the bright linings of dark situations. Plot-wise, Life is Sweet explores, in a rather meandering fashion, the home life of one working-class English family: catering-chef Andy (Jim Broadbent), preschool teacher Wendy (Allison Steadman), and twins Natalie and Nicola (Claire Skinner & Jane Horrocks) — the former a handywoman and the latter a political dissident. The cast shines here. In addition to great turns by the aforementioned Broadbent, Steadman, Skinner, and Horrocks, there are interesting supporting turns from Timothy Spall, Stephen Rae, and David Thewlis. [Spall is bizarre in his most against-type role of his career; and it’s fun to see Thewlis as an unnamed boyfriend only a few years before his breakout in Leigh’s Naked — more on that film below.] You can really see Leigh’s filmmaking and rehearsal ideologies at work in the various character interactions. Leigh is (in)famous for spending lots and lots and lots of time with his actors prior to shooting — during which they conduct immense amounts of research, completely construct character backgrounds and psychologies, and work on the development of the script. [However, once the collaboration is complete and everything is finalized, there’s a strict adherence to what has been created.] This results in scenes where the actors completely disappear into their roles and the various character interactions really do feel naturalistic and cultivated over a long period of time in close proximity. A wonderful, underrated gem. Naked (1993) – When you’re exploring Mike Leigh’s films, you’re really working within a relatively narrow cultural, emotional, and temporal framework — i.e. contemporary British working-class life and a difficult, tragic life dotted with occasional spurts of connectivity and brightness. There are exceptions to this, of course, with period-pieces like Vera Drake and Mr. Turner, as well as a character like Sally Hawkins’s irrepressible Poppy in Happy-Go-Lucky. But the truest anomaly in Leigh’s oeuvre is also the movie that really raised his profile with critics: Naked. Winner at Cannes for both Best Director and Best Actor (and nominated for the Palm d’Or), Leigh’s fourth feature-length film is…an experience. 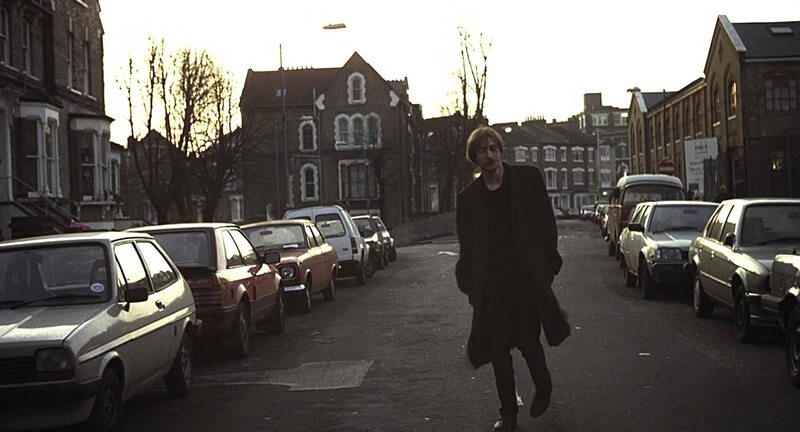 Naked follows Johnny (David Thewlis), as he slinks and pontificates around London over the course of a day (or so) and partakes in long-and-fast philosophical “conversations” (really, monologues) with miscellaneous strange, violent, and lonely creatures. As a character, Johnny is insufferable — he’s arrogant, pretentious, cruel, verbose, childish, manic, etc. But in terms of performance, Thewlis is absolutely breathtaking and produces one of the very best performances ever captured on film. [Seriously, if you’re only familiar with Thewlis from his work in Harry Potter or Fargo or something like that, you really need to watch this movie.] To be fair, the film does feel a little bloated and it features an entire storyline (involving a violent sexual predator) that doesn’t really add much aside from spectacle — and those aspects keep it from being higher on my list; however, despite these flaws, Naked is still a directorial and acting tour-de-force in many ways and certainly deserves its reputation as one of Leigh’s very best. Oh…and it also happens to feature what is probably my favorite closing shot in all Leigh’s canon. Another Year (2010) – One of Mike Leigh’s most recent films is also one that feels the “oldest” in some sense or, at least, the one that is most interested in the process of aging and the maturity that (sometimes) occurs — i.e. how someone can both grow old and remain young at the same time. Following a year in the life of married couple Tom & Gerri (get it? ), we see them at their respective jobs, working out in their garden, hosting their friends, coping with family tragedy, etc. etc. Starring Jim Broadbent, Ruth Sheen, Lesley Manville, Oliver Maltman, Peter Wight, and David Bradley (as well as several other Leigh regulars), there’s not much manufactured drama or comedy here; rather, there’s a sort of effortless, meandering quality to both the narrative and these characters — i.e. more than any other Leigh film (perhaps other than Four Days in July), Another Year kinda feels like a documentary. Really…the only “structure” is that each of the film’s four scenes takes place in a distinct season, and that’s about it. But the pleasure is seeing these wonderful actors embody their roles. [Broadbent and Sheen are particularly phenomenal in this film!] While it’s not quite on the same level as “peak-Leigh” in my estimation, it’s arguably the most polished and the most emotionally engaging of his second-tier work (and, in my mind, just slightly better than other films in this tier like Mr. Turner and Happy-Go-Lucky). My only recommendation would be that, if you undertake a Leigh-watching marathon of your own, I’d save this one towards the end of your viewing, as its meditation on age really works best after having watched his other works. There’s an argument to be made that, for casual American audiences, pretty much each and every film by Mike Leigh could be called “underrated,” as his work just never seems to gain much viewership here, aside from critics and cinephiles. [And even among that crowd, he rarely if ever gets brought up as one of our greatest living directors.] Happy-Go-Lucky or Vera Drake (and/or maaaaaaybe Mr. Turner) are probably the Leigh films most likely seen by American viewers, although even those are wildcards in terms of viewership. However, let’s go into the deep-cuts here with one of Leigh’s television films: Four Days in July (1984). As mentioned earlier, Leigh has done quite a lot of TV directorial work during his career; in fact, there’s almost twenty years between his first and second films, as he focused mostly on television (and I think scriptwriting / playwriting work) during that time. Leigh actually had two respected television films come out in 1984: Four Days in July and Meantime. While the latter film is generally more critically respected — and even has a Criterion version now — I actually think that the former is the richer and more engaging film. Set in Northern Ireland over the course of a few days during “The Troubles” (i.e. the social, cultural, political, and religious conflict between those who wanted to remain in the United Kingdom and those who wanted to secede and create a unified Irish nation). Here, we follow two families — one Protestant, one Catholic — that are each expecting their first child; and we see them interact with their coworkers, neighbors, friends, etc. as they make their preparations to bring new lives into a tumultuous time for a tumultuous country. Not much “happens” in this film — even by Leigh’s standards — but there’s a certain delight and poignancy to the various conversations and eccentricities of the characters that we as viewers meet. It’s a bit tricky to track down a copy of Four Days in July, but it’s a film worth seeing and one that I’d like to see remastered and re-released at some point. As with a couple of the other directors I’ve reviewed for this project, I actually don’t think that Leigh has made a “bad” film in his career — at least among the ones that I’ve watched. His made-for-TV films (like Meantime and Four Days in July) are rough at the edges production-wise, but that’s to be expected from projects with limited finances. If I had to pick one that you could skip, I’d probably say Leigh’s very first film: Bleak Moments (1971). Emotionally, the film has some nice (depressing) moments; however, it just doesn’t quite filll its run-time. Even though it’s only about an hour-and-a-half long, Bleak Moments really feels like it ought to be a short film, and it can’t quite hold up its own weight when stretched to a full-length film. Still…you definitely see here many of the themes, interests, etc. that Leigh will explore in more depth (and in better films) with his subsequent work. So this isn’t a “skip because it’s bad” selection; however, unless you’re a Leigh enthusiast, you can probably stick to the films that he creates afterwards without missing much of a beat. While Leigh has done a couple of period movies (i.e. Vera Drake and Mr. Turner), most of his movies focus on contemporary (or, really, post mid-20th century) working-class life among British families. And with the exception of something like Naked, which is something of a tonal anomaly in his oeuvre, pretty much all his movies are going to be exploring similar themes and working on somewhat similar emotional registers. With that in mind, I think I’d start with Life is Sweet (1990). Featuring some regulars from his other films (e.g. Jim Broadbent, Timothy Spall, etc. ), Life is Sweet also demonstrates the director’s knack for presenting interesting, well-defined characters with notable quirks; moreover, it balances the tonal registers of joy and sadness a bit more than some of his other films like All or Nothing or Happy-Go-Lucky. Overall, it’s just a good introduction to his work; and, if you’re digging the working-class family dynamics, then you might move to some of his other films like Secrets & Lies, Another Year, High Hopes, or even Four Days in July. I’d probably suggest that you build your way up to Naked rather than watching that film first, lest you develop too soon an idea about Leigh’s style from that filmic outlier. One of the best parts of this Director Retrospective project has been reconsidering directors who I probably took for granted (e.g. Steven Spielberg, Michael Mann, etc.) and discovering directors who I’d ignored for far too long (e.g. Hayao Miyazaki). Having watched a bunch of Mike Leigh films now, I can say that I think he may have earned his way into my personal “Top 5 Directors” list, as I consistently really, really loved his films. I don’t think Leigh’s work is necessarily for everyone — his subject-matter is relatively narrow (i.e. British working-class) and not much “happens” in his movies. It’s more like being invited to observe the lives of people who have been around before you started watching and will continue on after you stop watching; and the results are often a mixture of emotional elation and devastation. Honestly, while some of his films are stronger than others, I don’t think he’s made a “bad” film — which is remarkable for a 45(ish)-year career. While he’s enjoyed critical success — seriously, it feels like a bunch of his movies have been picked up by the Criterion Collection — he’s just never translated that into commercial popularity here in the U.S., which is understandable but also sorta disappointing, as I believe that he really belongs in the conversation of today’s “best living directors.” Personally, I would say that he’s created four legitimate cinematic “masterpieces” that deserve to be preserved: Secrets & Lies, Vera Drake, Life is Sweet, and Naked. Definitely someone to checkout if you’re unfamiliar with his filmography!